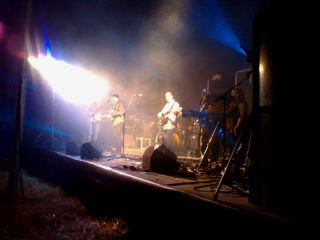 Hydro Connect: appalling, unacceptable conditions, but great music, food and drink. Major surgery required! Here's the deal: It's over £140 for a Hydro Connect weekend camping ticket, £20 for parking, an extra £75 if you want to bring a camper van. 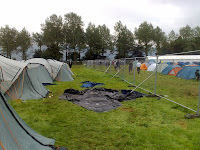 A programme's an additional £8 and Tangerine Fields charge a whopping £470 for a six-man tent, already erected, with air beds and sleeping bags (but no pillows). Ostensibly with special toilets and showers, which turned out to be nonsense. In other words, Hydro Connect, the way we did it, was an expensive treat (confession: connections wangled me a free parking ticket; still, this was a heavy investment). Would it be worth it? The lineup (Sigur Ros, Glasvegas, The Roots, Kasabian (sorry, did I say Kasabian?) Elbow and of course Paolo Nutini to name but a mere fraction of the attractions) was superb, and I knew from last year (when I bused in for the Saturday) that the food and drink would be excellent. Surely it would be a splendid weekend? Indeed, the music WAS great, the stages run with military precision, the food and drink (especially the Loch Fyne Whiskies - thanks Annabel!- and Argyll foods tents). Friends and family were there and socially it was really enjoyable. Yes, Inveraray Castle and its immediate environs provide a wonderful setting for two stages (one in a natural amphitheatre, BUT access to the site is HORRENDOUS. The main parking area is TWO MILES away and only staff were bused to and from the arenas . Everyone else had to walk, along an increasingly swampy and dangerous path. 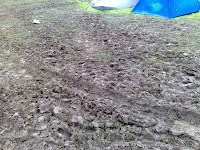 The camp site, by early Friday evening, was a quagmire. This was unforgivable, as it must have been clear from last year what was likely to happen. The toilets were, as usual, overwhelmed almost instantly. 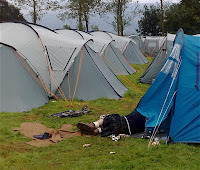 Are environmental health regulations simply put into suspended animation during rock festivals? 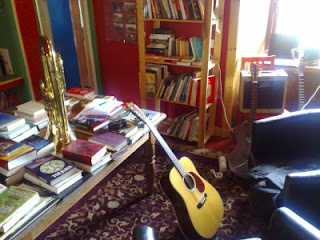 Answer, no, they're not: for evidence, try the much less ordure-enhanced Wizard and Belladrum. On Friday there was a what some found an intimidating, neddish atmosphere, blamed by people I spoke to on the Kasabian day-ticket punters. 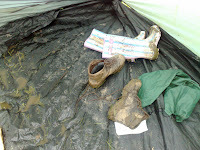 Certainly, the all-night partying in the next door tent to ours was both intrusive and earsplitting. But the kids didn't even notice it; by morning I had the Trangia stove on for coffee and things were looking brighter. Saturday was a good day in every respect but the grinding, horrible conditions. 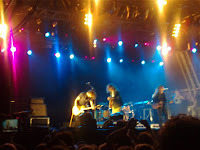 Grinderman, Glasvegas and P Nutini (plus OF COURSE his very excellent band) were impressive. And maybe it's good local politics not to allow the main food outlets to open for breakfast (sending us into Inveraray itself for an excellent cafe repast) but it felt cynical. A lot of the time, as a camper, I felt like an inconvenience for the organisers, but one from whom every last penny was going to be squeezed. Muddily and Squelchily. I had to abandon ship on Sunday because I wasn't confident about getting to Aberdeen in time for the programme on Monday. Susan, James and Martha (the bairns, it must be said, seemed to love the experience, though James did count one toilet visitation as 'the single worst experience of my life'. And this from a boy who was brought up on (not all the time) a biological composting toilet. 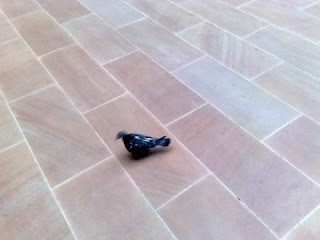 Mind you, he is reading a lot of Cormac McCarthy at the moment). If you want to enjoy some of the music while thanking your lucky stars you didn't have to encounter such a loo, then you can visit our special and glorious BBC Radio Scotland festival website. Anyway, back to that deal: value for money? 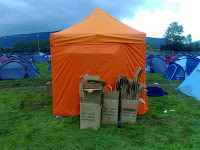 Well, I'm going to blog more about my four festival experiences this summer, but let me just say this: Wizard, last weekend, was £65 including camping AND parking. You got a full lanyard-mounted programme free if you bought a copy of the Evening Express. However, there were wonderful moments for me AND the family at Connect, and as one sympathetic policeman said: 'You won't forget it.' Uh-huh. Susan and the kids, as I write, are planning to head for Glasgow after Sigur Ros. Two nights of horrendous Tangerine Fields conditions is enough. Next year? Unless the access, parking and camping is sorted out, punters will not pay this kind of money, 'boutique' labels notwithstanding. I most certainly won't. I can't help feeling that the site's limitations are insurmountable. Apart from that nagging, constant feeling that a gloating Duke of Argyll ('I am the most rock'n'roll Duke in Scotland')is sitting up there in his castle, protected by Gurkhas and men in Stalag Luft watchtowers, counting his cash over champers and laughing at the hapless punters down in the mud. Anybody have a nice, dry, spare airfield on the sunny east coast somewhere? Funnily enough, I know of one...and it's nowhere near Kinross. Violetta the Volksbus is heading for Connect! So...here she is! A PROPER camper! 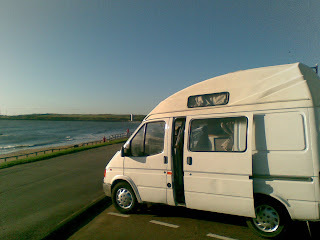 Last night, under conditions of great secrecy, I took a train from Glasgow to Edinburgh, another from Edinburgh to Newcastle, and then finally one from Newcastle to Darlington, there to meet a man called Don, custodian of Violetta the VW camper (technically, a Caravelle minibus converted to camper status). It was an eBay adventure! Would Don be there? Would the 1985 bus now known as Violetta (a mere 270,000 miles vintage) make it back up the road to Glasgow? Through the night? A friend has described the A1 in its Northumberland stretch as 'a third world road' but that's pushing it. It is, however, pretty intimidating in the wee sma' hours when the petrol gauge (typical VW) merely wavers slightly no matter how much very expensive fuel is in the tank. Never has the petrol station at the Redford Barracks exit on the Edinburgh City Bypass loomed so reassuringly. There is, as Dave, a fellow VW fan, says, something oddly addictive about these old rear-engined buses. That strange chirruping exhaust note, the way they weave about in the wind...anyway, Violetta made the 222 miles to Glasgow safely (the indicators gave up around Durham, but Don says 'the relay just needs a wee wiggle') and the great news is that Susan is (a) not too upset and (b) has found the missing camper van ticket for the Connect festival! A stroll by the River Kelvin...call the cops! I'm in Glasgow, so there I was crossing the Queen Margaret Drive bridge over the River Kelvin in Glasgow when I spotted...a man in the water. Well, not so much in as on. 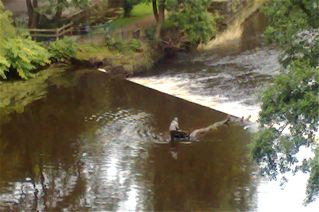 He had climbed out along the weir (site of an old mill, I think)and was apparently trying to free a large fallen tree that had been swept down the river and become jammed. No life jacket, no help...a small and interested crowd gathered on the bridge to watch, and the consensus was that the police should be called. So I dialled 999. Within minutes, police and fire brigade had arrived, as the man gave up bouncing on the log and began heading for the bank. The sirens must have been a giveaway. I left as various members of Her Majesty's Constabulary began....introducing themselves to the chap. This being Glasgow, spectators were not short of a comment or two - 'Talk about walking on the water....he's just having a wee stroll by the river...' etc etc. Anyway, he didn't drown. He didn't even lose his hat. Wizard wheeze! Sileage pumps rescue festival from flooding fears! And so a fine time was had by all at the Wizard Festival, Roy and Sam Thain's visionary quest to bring rock'n'roll to the rural heartlands of northern Aberdeenshire. 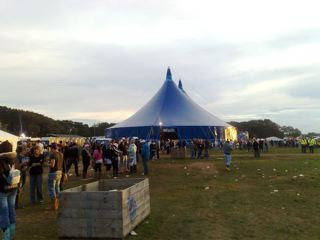 It's held at New Deer, deep amid some of the finest arable land in Europe, inland from Peterhead. This was my first visit to the area for many years, and I'd forgotten how impressive the huge vistas of field and forest are. It's a bit like Normandy. Only colder. And wetter. So wet, indeed, that flooding threatened to ruin the party before it even started. Some big names had been booked for this, the festival's second year, including Supergrass, The Damned, Alabama Three, Peatbog Faeries and more. Nearly 6000 tickets had been sold in advance (at a very reasonable £65 for the weekend, including parking and camping - take note, DF Concerts!). But torrential downpours on Thursday and Friday turned part of the site into a loch. Fears of cancellation were averted when the community spirit which pervades this most couthy of rock fests came into play. 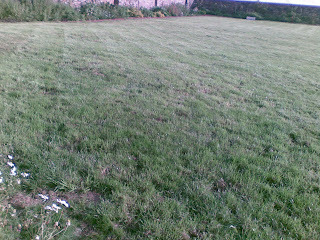 Local farmers lent their sileage pumps and soon the site was usable again. And then the rain stopped. 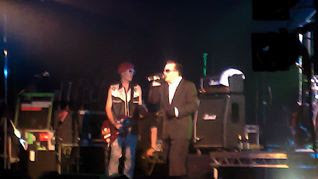 I arrived on Friday evening to m/c bits and pieces - including The Damned, who may just be Dave Vanian and Captain Sensible, these days, plus help, but were a truly magnificent noise-cartoon. Neat Neat Neat, a single which helped redirect my life, was done full-blooded justice. They were fantastic fun. 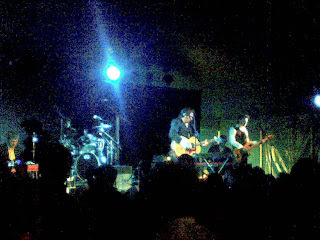 Supergrass (flown in from Aberdeen by helicopter - this is North Sea Tiger country, after all, with choppers ten a penny) ate up the enthusiastic atmosphere and delivered in fine style to a crowd whose good nature matched its capacity to remain steadfast under intense lubrication. I asked a policeman why there had been so little obvious drunkenness and he replied: 'That's just because they're all still standing up. 'At no other festival have I seen such stalwart refusals to fall over. In truth, the down-home vibe was omnipresent, a casual warmth from the organisers matched by a real command of the essentials. 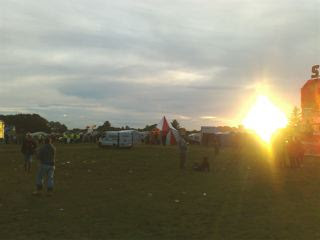 Everything worked, the backstage team was cool, calm and very sorted. The aim was to provide something for all the family, and the children's area was seriously impressive, with a proper climbing wall, bucking bronco and lots more fun stuff. Saturday (after rushing back into Aberdeen to hand over Gloria the camper to Michael from Orkney, eBay winner of her dubious charms) was a fine day of weather, and the audience was commensurately bigger and in even higher spirits. I did a wee acoustic set at the Banshee Tent, which went well, and I saw some great lesser known bands - including Eskimo Blonde from Aberdeen and the astonishing Toy, whose in-your face attitude was matched by some truly excellent material and an impressively bolshie vocalist. They were like PIL crossed with Elbow. They all looked about 16. 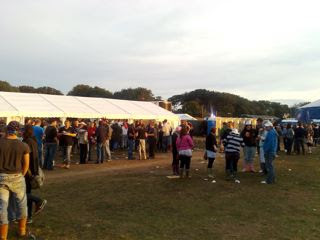 There was superb Cullen Skink available, though maybe there could have been more local produce, and there was unhappiness about the noise from the fairground rides, which were far too close to the Freedom Stage. John McCusker, who was playing (on Friday) with Roddy Woomble, Kris Drever and the delectable Heidi Talbot, looked particularly pissed off with the waltzer. MacFloyd (pictured) were a revelation. Note-perfect renditions of Pink Floyd's greatest anthems were deliriously received by a capacity crowd, many of whom were far too young to know the Floyd's original releases. My jaw was well a truly drappit. The Peatbog Faeries went down brilliantly too, with their progressive-bagpipe-fiddle-brass amalgam, and the A3, of course, shook Aberdeenshire to its very roots. My thanks to all concerned, especially press officer Angela and John at the Voodoo Stage, and to the Beggs in Stuartfield for looking after me so well. I have never even seen a breakfast of those dimensions before! Hell of a day yesterday, involving (due to the ISDN breakdown) a mad dash into Lerwick to do the programme, a mad dash back home (time to check the ISDN, which was working), a very ungainly trip into Lerwick with guitar, computer and all sorts of other gubbins on the bike, finally reaching the ferry at 6.00pm. Many thanks to the local BT engineers who worked to get the Radiocroft back on line. Hopefully everything will still be working when I get back home in 10 days or so. It's almost unbelievable, but just 48 hours after the new ISDN 2e line was installed, and one day after successfully broadcasting the show using it, it has failed completely. BT has reset the electronic 'card' in the exchange, but to no effect. All this on a day when I need to get the boat south, AND need to take a motorbike and various other complicated things with me. Back on the air at The Radiocroft, and the show today seemed to be fine (listen again at bbc.co.uk/iplayer). Maybe a couple of moments where the signal south became a bit 'metallic' (Engineer Ron's word) and two instances of 'return dropout'. The truth is that British Telecom HATE the now-obsolete ISDN (Integrated System Digital Network) lines, and want everyone to go to ADSL (broadband). BUT YOU CANNOT BROADCAST LIVE INTERACTIVE RADIO USING BROADBAND. At least not yet. ISDN is a one-to-one high quality connection. Broadband is about downloads, not uploads. The stuff you get cascading onto your computer is much faster and more copious than the stuff going back up the line. Which means me, talking, and that's, in this instance, the important bit. Oh, and the quality drops if more users come on line. 'Contention rates', this is called apparently. Skype etc is all very well, but won't wash on a hi-fi. Or any speaker bigger than, oh, an inch. Eventually, broadband will be made to work for broadcast radio, but for the moment, I need ISDN. And for the moment, BT WILL provide it. At a price. And despite cutting off my Business Highway, leaving me unable to broadcast from The Radiocroft for two months, when we'd previously agreed a seamless tranfer to ISDN2E...hell's teeth, I know people with THREE ISDN lines installed for videoconferencing...enough. Rant over. A million thanks to Ernie the BT engineer for getting me back on air today. 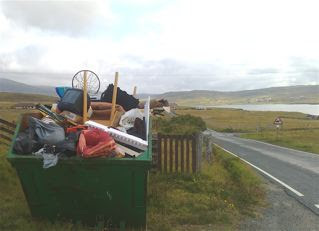 ...and despite going past this skip EVERY DAY, I have NEVER seen anyone putting anything in it. Note: the basketball hoop, obviously dumped by someone totally frustrated by over-exposure to Olympic athleticism (he said grumpily, having injured his foot while attempting to emulate Chris Hoy, only more slowly, and on a mountain bike. While carrying a pint of milk and six bannocks). Spies. I've met people who claimed they once were (usually drunk or, in one case, clearly demented, but in a thoroughly John Le Carre way)or insisted they weren't. Presumably, if they were, you'd never know. Or at least, gossipy gobs-on-sticks like me, with radio programmes,blogs and occasional pieces of published paper, never would. William Gibson's staggeringly good novel Spook Country combines some of his cyber-thriller trademarks with a cool portrayal of what superannuated spies might get up to (and with whom) in a post-9/11 society; it made me want to go to Vancouver immediately; it made me discuss 'locative art' with a computer-illiterate artist who was immediately transfixed by the possibilities; it made me seriously consider buying a pair of Adidas GSG 9.2 'tactical boots', and discover what on earth 'broasted potatoes' are. Also to revisit Norman Cohn's Pursuit of the Millennium, which is extensively referenced. And to, at last, try and switch on my Nokia N95's GPS. 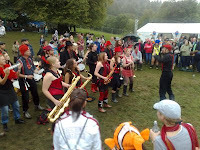 The weather at Belladrum was a classically Highland mixture of sunshine and downpour; fortunately the dry spells co-incided with most of the performances. The Malt and Barley Revue at the excellent and extremely well-run Co-op Verb Garden Tent, went down well and attracted a fair crowd of round about 100. Considering the competition included The Waterboys, Edwyn Collins and The Lemonheads, I was pretty pleased. Mind you, they didn't have free whisky and sofas. Why the Ness Yoal (a classic Shetland design)? Built in the Highlands as part of come kind of community training scheme, I think. And a very nice job too. 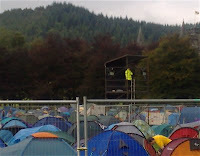 What's great about Belladrum is that many in the crowd come for The Festival, as opposed to the bands playing. So things like the brilliant Potting Shed (a kind of open mic spot in the open air) proved hugely popular, the theatre, comedy and children's events were given a lot of time and space and the 'spirit of '68', portrayed as a this year's theme, was genuinely abroad. As, unfortunately, was the mud. Jefferson Starship were a hoot. David Freiburg is 70 years old. Paul Kantner looks like a bizarre SAGA rock'n'roll cartoon. But they give it hell, and the live versions of classics like Jane and even White Rabbit were surprisingly affecting. Justin Currie looked agitated throughout his set, but it was great to hear one or two old Del Amitri songs amid stuff from his teriffic new CD What is Love For. And was that Nick Clark on bass, last seen by me in the Sub Club, circa 1985? Caught a little of Idlewild in full-on rock band mode. Why didn't they become the new U2? Coulda been more than contenders...though Roddy Woomble would certainly have become very bored very quickly. Caught a little of Edwyn's set, and it was good to see the full band in action, with Roddy Frame on lead guitar. 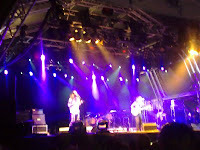 The Waterboys' greatest hits set was a fitting finale. The fireworks were some of the best I've seen. Gloria got back to Aberdeen without a problem, though I was careful to get up and away early as the production car park and exit track was beginning to resemble a quagmire. Now for the boat home, and, in a fortnight, the Wizard Festival at New Deer. In time to see Justin Currie. How far will Gloria get? 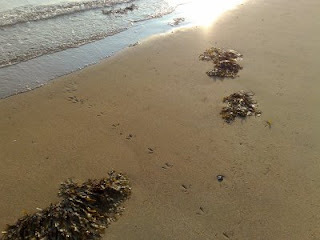 ...as far as Aberdeen beach, anyway. A beautiful day here in Castle Greyskull, and a fine crossing from Shetland. Unfortunately, ever since the legendary bus station cafe (which used to open at 6.00am) shut, there's nowhere to go in the city at de-boating time. 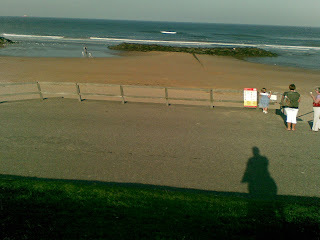 Except the beach, where I planned to make a cup of tea on the camper's stove. Except I remembered that the water on board was several months old. Plan is to spend the morning worrying about Gloria, changing guitar strings and then preparing for the show, which will feature, of all people, Jefferson Starship! No, really! Oh, and getting hold of some fresh water. 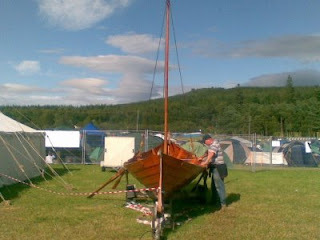 After a very short and hectic stay at home (cut the ludicrously fast-sprouting grass, but it already needs done again) it's off on the boat tonight, heading for the Belladrum Tartan Heart Festival. I'm performing the Malt and Barley Revue at 9.15pm on Saturday in the Co-op Verb Garden Tent, if you happen to be attending. Three free drams of the best whisky for every customer! All of this is conditional on Gloria the camper van actually making it, first to Lerwick, and then along the A96 to Beauly. It's an F-reg Transit adventure! Heading home to Shetland on tonight's boat for less than a week, before having to go south again for the Belladrum festival. It's a dreich old day in Castle Greyskull, but yesterday and the day before were nice...and on a hot day, Aberdeen's beachfront really comes into its own. Down to the King's Links for 50 balls on the golf range, a windswept walk along the (must be the longest in the UK) prom, check out the surfers/kayakers/oil supply boats/paragliders and then head for the coterie of cafes for seaside food at its most elemental: TC's restaurant, in the former Harry Ramsden's, is very good indeed - a splendid bit of haddock (they had monkfish and halibut too, with grilling an option for those not willing to be battered) with proper chips and mushy peas. A redundant salad, but then, aren't they all? Two pots of tea, bread and butter (which was inappropriately wholemeal) and then, ahem, a chocolate fudge sundae using some serious local Italianate ice cream. I felt drugged with sugar and fat for about 15 minutes, then alarmingly ill, then very sleepy indeed. Which led to a disastrous 8.00pm to midnight snooze and the consequent inability to get back to sleep until 4.00am. It wasn't all wasted, though: I finished Don Winslow's The Dawn Patrol, which is, sadly, nowhere near as good as his phenomenal The Winter of Frankie Machine, soon to be a Michael Mann movie with Robert De Niro, or its predecessor The Power of the Dog. Good on surfing, though. Which I'm now tempted to try.